Noah Star is sworn as the new Associated Student Government president by outgoing President Julia Watson at Senate on Wednesday. Star’s running mate, Christina Kim, was also sworn in as ASG’s executive vice president. 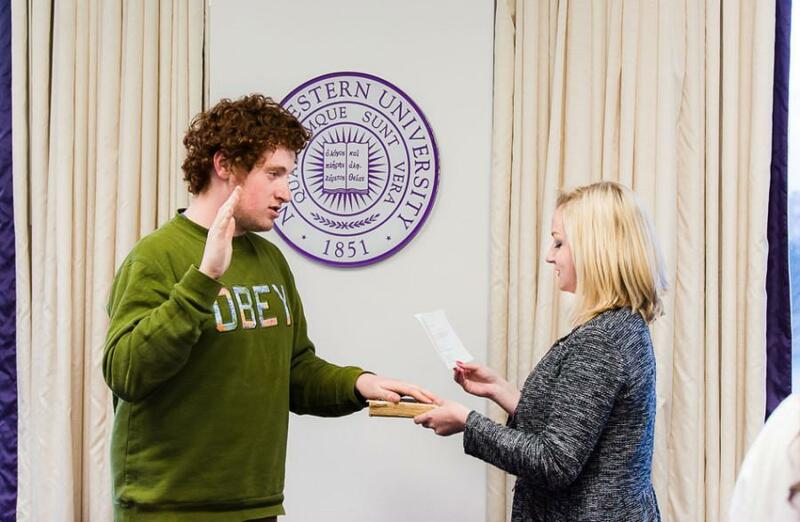 Northwestern students officially have a new student body president. Weinberg junior Noah Star was sworn in as Associated Student Government president at its Senate meeting Wednesday, succeeding Weinberg senior Julia Watson. Star and his running mate, Christina Kim, were elected with 60 percent of the vote Friday, defeating Medill junior Haley Hinkle and SESP junior Chris Harlow. Kim, a McCormick junior, was sworn in as executive vice president, replacing Weinberg senior Erik Zorn. Watson and Zorn both gave short farewell addresses, reflecting on their time in ASG. Watson said she stuck with ASG to fight for “justice and equality” and that it’s sometimes difficult to satisfy everyone in those pursuits. Zorn said he largely measures his success in ASG in terms of the connections he’s built. Later, ASG’s Mental Health Working Group presented some preliminary findings. The group said students reported a general disapproval of Counseling and Psychological Services. Harlow, ASG’s vice president for student life, led the working group and spoke about its findings. He said the group interviewed students from specific cross-sections of the student body, including international students, students of color and students who took a leave of absence. He said students reported a stigma against accessing mental health resources and a lack of diversity among CAPS employees. The working group will release a more substantial report near the end of Spring Quarter, which will include recommendations to improve the mental health climate on campus. Senate debated for a half hour which students should comprise the B-Status Finances Committee. The committee, which oversees the allocation of ASG funds to student groups that receive only a few hundred dollars per quarter, previously required six of its 14 members to be senators. Senate amended its code and removed that requirement. Now none of the 14 students need to be senators, though senators can still apply for the committee. Some senators objected to that change and said it would remove student-elected representatives from the funding process. But the amendment’s supporters disagreed, because Senate still needs to approve B-status funding. Weinberg junior Erik Baker, the senator who represents four sexual health and assault-related groups, spoke in favor of the amendment, saying non-senators could also function as representatives.